The Delaware County Historical Society held our annual Volunteer Recognition Event at The Barn at Stratford on April 19, 2018. The Society, almost entirely volunteer, takes this event to recognize the enormous contribution of all those who volunteer their time, talents, ideas, and enthusiasm to the benefit of the Society and the entire Delaware county community. Presenting outreach local history programs to county school classes, senior facilities, and anyplace else we can “Bring History to Life” in Delaware County History. Hiram Mills Perkins, professor of Mathematics and Astronomy at Ohio Wesleyan University. When the Civil War began, in 1861, he left his teaching position to join the Union Army. The 6′ 4″ 97 lb professor was rejected as unfit for service. Undaunted, Hiram did the next best thing… he returned to his family’s farm and raised hogs to help feed the Union Troops. Upon retirement in 1907, Hiram devoted himself to planning for an observatory in Central Ohio. In 1923, Hiram Perkins (at 90 years old) officiated at the ground-breaking for the construction of the observatory. Hiram died soon thereafter, never seeing his project completed. 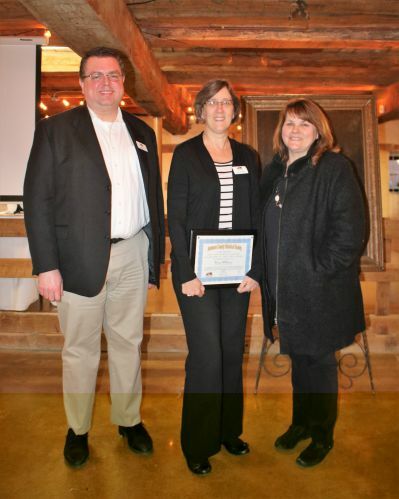 Karen set the tone for the volunteer recognition awards by recognizing the contributions of all the volunteers. On behalf of the entire Board, she thanked all the volunteers. Marilyn Cryder’s longtime dedication to the Society and her years of volunteer contributions in recognized by giving her name to the Volunteer of the Year award. Susan Logan described the many roles and contribution that led to this year’s award winner before calling Diane Williams to receive the award. The Director’s Award is a new recognition for a volunteer who especially contributes to assist the Society Director. Donna Meyer cited Ralph Au‘s breadth of volunteer activities (from lawn mowing to parking assistance to disaster recovery planning to technology to Treasurer) in presenting the award.